In the last installment, we examined some positive historical precedents for a new president’s foreign policy. In this installment, we will consider positive precedents for a new president’s domestic policy. For the Forgotten Man, and the Forgotten Woman, it’s nice to be remembered. 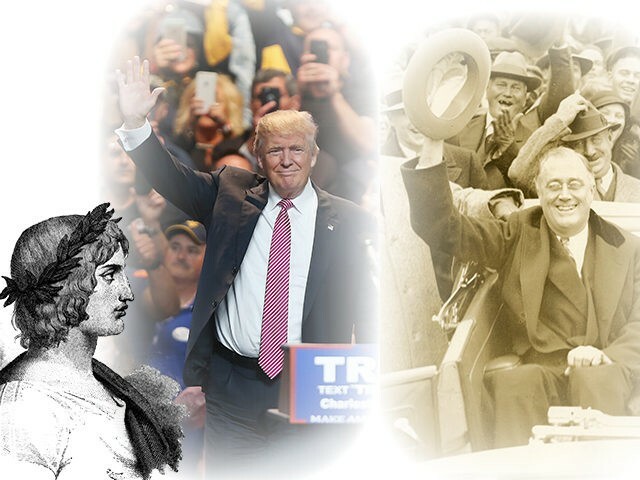 During the campaign, Donald Trump revived the phrase, “Forgotten Man,” which echoes back to the Depression years of the 1930s. Specifically, it harkens to Franklin D. Roosevelt, the great mid-century champion of blue-collar Americans. The American people appreciated FDR’s sense of urgency, which stood in stark contrast with Hoover’s prosperity-is-just-around-the-corner do-nothingism. So in November 1932, FDR won a massive victory, carrying 42 of 48 states. Thus we can see: The Forgotten People didn’t like being forgotten, and they were grateful to the candidate who cared about them. Your government betrayed you, and I’m going to make it right. Your jobs will come back under a Trump administration. Your steel will come back. We’re putting your miners back to work. The iron and steel forged in your mills formed the backbone of our nation. . . . This was the town that people flocked to from around the world to make their American Dreams come true. To be sure, there’s been a lot of forgetting in recent decades. The Democratic Party, once the stout champion of blue-collar America, has, in recent decades, neglected—shunned might be a better word—its political patrimony. Instead, the Democrats fell in love with a newer group during the Clinton-Obama years: the self-proclaimed “coalition of the ascendant.” That is, the multicultural high-low coalition of mostly non-workers (including college professors and their “snowflake” students) and trust-funders put together by Al Sharpton, George Soros, and Tom Steyer. This coalition worked well for Barack Obama in the elections of 2008 and 2012, though not so well for the Democrats in the elections of 2010 and 2014. Yes, it was during the Obama years that blue-collar America—now mostly exurban and rural as the cities have gentrified—gave up on the Democrats. In 2012, of the slightly more than 3100 counties (and equivalent political entities) in the US, Obama carried only about 700. And so, of course, the Republicans have benefited. Yet we might ask: Did the GOP, having taken control of Congress during the Obama years, itself fully remember the forgotten? On some issues, such as guns and abortion, the answer was obviously yes. But on other issues, such as trade and immigration, the answer, as any Breitbart reader knows, has been decidedly muddled. Yes, it’s sad that the folks who have played by the rules, paid their taxes, and fought in the wars were forgotten—as the forces of globalism, mostly cheered by the elites of both parties—took their terrible toll. As we all know, he talked a different language, with a different set of issues, than the other 16 Republicans in the presidential race—and he was richly rewarded. And then came Trump vs. Clinton. She tended on the campaign trail to lose that large vision and slip into the rhetoric of diversity, calling out explicitly to African-American, Latino, LGBT and women voters at every stop. This was a strategic mistake. If you are going to mention groups in America, you had better mention all of them. If you don’t, those left out will notice and feel excluded. Which, as the data show, was exactly what happened with the white working class and those with strong religious convictions. Fully two-thirds of white voters without college degrees voted for Donald Trump, as did over 80 percent of white evangelicals. The unprotected people of America, who have to live with Washington’s policies, rebelled against the protected, who make and defend those policies and who care little if at all about the unprotected. That broke bonds of loyalty and allegiance. Tuesday was in effect an uprising of the unprotected. It was part of the push-back against detached elites that is sweeping the West and was seen most recently in the Brexit vote. Even now, the liberal smugness and condescension is still ten-feet thick in many parts of Blue America, as Vice President-elect Mike Pence discovered the other night at the Broadway show Hamilton. As s hairdresser, Kaatz works for a living, and so she probably doesn’t have time to keep up with all the lefty ranting. So she might have missed, for example, this sneering February headline from Salon: “America, you’re stupid: Donald Trump’s political triumph makes it official—we’re a nation of idiots/ Trump’s rise proves we’re full of loud, illiterate and credulous people.” And yet it’s safe to say that Kaatz knows who her detractors are—and she votes against them. We can observe the Democratic political class has now realized that if they can only win in the urban “blue dots,” then they lose. And in fact, Hillary carried only about 500 counties—200 less than Obama four years ago—and she lost. The general attitude of the left was: Disagree with us? You’re probably racist, xenophobic, sexist, bigoted or all of the above. As a bemused aside: Wasn’t it just yesterday that the Democrats, and their handmaidens in the MSM, were telling Republicans that they were doomed if they didn’t embrace multiculturalism and “comprehensive immigration reform”? Yet as always, as James Carville famously said, “It’s the economy, stupid.” And so where were the Democrats on that issue? Here’s where they were this year: busy dreaming up schemes to decrease growth. To cite just one example, we can consider the language of the 2016 Democratic national platform. That document included a full 16 paragraphs on “climate change,” as well as 14 paragraphs on the rights and needs of “indigenous tribal nations.” Meanwhile, the platform included just two skimpy paragraphs on workers and wages. To be sure, it seems strange that a political party would lose interest in such an obvious political staple as economic growth. And yet if we look more closely, we can see, from the perspective of the “coalition of the ascendant,” that such economic neglect makes a kind of sense: After all, billionaire financiers such as George Soros and Tom Steyer don’t have to worry about money; instead, they have to worry about saving their souls, bowing down to whatever gods they might be serving. In the years and decades ahead, our countries have to make sure that the benefits of an integrated global economy are more broadly shared by more people, and that the negative impacts are squarely addressed. We can note, incidentally, that the Greeks have been crushed, economically, by the European Union—a sort of US federal government writ large. So now Obama, after the election, as he faces the Trumpian extirpation of most of his brittle legacy, is waking up to the idea that prosperity should be “more broadly shared by more people.” Of course, with Obama, one wonders whether his definition of “people” includes the American people, at least the ones who born here—and yet happily, we won’t have to worry about him for much longer. By contrast, the incoming Trump administration is thinking about the American people. In the sharp words of Trump senior counselor Stephen K. Bannon, “The globalists gutted the American working class and created a middle class in Asia.” That is, by outsourcing the good-jobs-at-good-wages from places such as Johnstown, and sending them to China and other Far Eastern countries, the globalists have boosted wellbeing on the other side of the Pacific. Working people and middle-class people feel cheated, and they have every right to feel cheated. There was no real reform after the recession and the crash on Wall Street. There was no real effort to reverse the gains of the one percent, so people feel cheated. And if Democrats and progressives don’t give them a crystal clear understanding of how we’re going to change that, of course, they’re going to feel dissatisfied and disconnected. Strange how DeBlasio managed to keep that cutting critique to himself during all these past eight years! Blue-collar Americans are at the center of Mr. Schumer’s emerging strategy. He believes that Mr. Trump won by appealing to the middle of America with what was essentially a Democratic economic message on trade and job creation. He is convinced he can leverage that with the new president. Now of course, some will immediately riposte that Schumer’s plan—that is, jamming against more orthodox Republicans in Congress—is just a ploy. That is, the Democrats are still the party of globalism and multiculturalism—and not of the middle class. All that is probably true, but as we also know, plenty of ploys have succeeded. And who knows: Perhaps, just possibly, the Democrats will sincerely change. After all, losing has had, in the past, exactly that sort of effect. We are saying, Mr. President, you have two choices: Work with us and you will have to alienate your Republican colleagues, or break your promises to blue-collar America. I believe that blue-collar America voted for Trump mainly because of Democratic issues like trade, not for Republican issues like tax cuts for the wealthy. So how will Trump respond to Schumer’s challenge. As we all know, the best response is usually deeds, not words. And Trump has some big deeds up his sleeve. Trump has always had an energetic attitude toward infrastructure. Of course he does—he’s a visionary builder, and visionary builders like to build, and to see things being built. We are going to rebuild our infrastructure . . . We have bridges that are falling down. We have many, many bridges that are in danger of falling. Her numbers [are] a fraction of what we’re talking about. We need much more money than that to rebuild our infrastructure. . . . I would say at least double her numbers, and you’re going to really need more than that. So his campaign cooked up an ambitious infrastructure plan, co-authored by University of California academic Peter Navarro and New York City investor Wilbur Ross. And now, according to The Hill, Trump’s transition team has been exploring the possibility of a national infrastructure bank. That is, a public-private partnership that would leverage federal money to attract state and private dollars to fund projects. We’ve had zero leadership coming from the current administration. No suggestions, no ideas—they’ve just been kind of like pretending it’s not an issue. Meanwhile, the Trump transition is pushing the envelope: In the words of Trump adviser Steve Bannon (who in the past was executive chairman of Breitbart News), “It’s everything related to jobs.” In addition, Bannon emphasized that the trillion-dollar infrastructure figure was a serious goal for Team Trump. To be sure, a trillion dollars is a lot of money, but this a big country, and our needs are even bigger. The American Society of Civil Engineers, for example, estimates that US infrastructure needs an additional $3.6 trillion. With negative interest rates throughout the world, it’s the greatest opportunity to rebuild everything. Shipyards, ironworks, get them all jacked up. . . . It will be as exciting as the 1930s, greater than the Reagan revolution—conservatives, plus populists, in an economic nationalist movement. Yes, it’s interesting that Bannon cites the Rooseveltian 1930s as a precedent. But then, of course, Bannon knows that Roosevelt a) dramatically reduced unemployment—it fell from 25 percent to one percent during the 12 years of his presidency—and b) was re-elected in 1936 in an epic landslide, carrying 46 of 48 states. His Public Works Administration and Works Progress Administration, using combinations of public and private money, solicited proposals from states and cities, hired millions of workers and eventually built 78,000 bridges, 650,000 miles of roads, 700 miles of airport runways, 13,000 playgrounds and 125,000 military and civilian buildings, including more than 40,000 schools—in most cases to high standards of quality and design. The federal government built the La Guardia, Ronald Reagan Washington National and Los Angeles International airports, the Upper Mississippi locks and dams, the Bonneville power project on the Columbia River, the Robert F. Kennedy Bridge in New York, and the Florida Keys Overseas Highway. Most are still in use today. To a large degree, this is the infrastructure that made America great, to borrow Mr. Trump’s catchphrase. Of course, some will accuse FDR of practicing Keynesian economics. To which Virgil says, infrastructure is so obviously vital to a strong economy that building it, through whatever mechanism, is more commonsensical than Keynesian. Indeed, long before Keynes, it was Alexander Hamilton, the apostle of private-sector growth and profit, who argued for “internal improvements”—that being the 18th century term for infrastructure. For his part, Stewart cites possible projects that he thinks would be well remembered, from a Northeast Corridor maglev train to a Miami seawall to improvements to I-70 in Denver. We can step back and observe: One needn’t agree with all, or even most, of Stewart’s suggestions, and yet still see the point he is making. Namely, big and bold always punches through—we know it when we see it. Furthermore, it’s worth remembering that the definition of “infrastructure” can and should be stretched to include anything that supports private-sector job creation. So infrastructure is not just about roads and bridges, it’s also about dams and bike paths, not to mention broadband and other Internet goodies. Indeed, it’s even about homeland security. As noted in a pair of articles here at Breitbart in July, written in the wake of the truck attack in Nice, France that killed and injured hundreds, there’s much to be said for construction of new “passive defenses,” such as bollards and other kinds of barriers. 3. So How to Pay for All This Infrastructure? At present, there’s a problem with the way Uncle Sam does his accounting. And that is, government bean counters are just that—bean counters. They use what’s known as “static analysis”; namely, every form of spending is defined as, simply, a cost. The benefits of spending are presumed to exist, but they are not accounted for. And this leads to a mental trap: As a matter of accountancy, the feds can’t see the difference among various kinds of spending, among the spending that provides a big positive “return on investment” (ROI), a small positive ROI, or no positive ROI. And so it’s no wonder, then, that value-adding infrastructure spending is lumped in with everything else the government does—to the detriment of truly valuable endeavors. The alternative to static analysis is “dynamic scoring,” which is premised on the reasonable point that government policy can affect the economy, for better or for worse—so let’s figure it out and measure what’s better and what’s worse. For its part, the Trump campaign argues that its pro-growth, pro-jobs infrastructure policy will expand the economy and, furthermore, that dynamic scoring will reveal that positive truth. As Trump economic adviser Wilbur Ross told Bloomberg News, dynamic scoring shows that Trump policies could add more than $2 trillion to the economy. Which is to say, Trump’s proposed infrastructure expenditures are a good deal, because $1 trillion invested generates another trillion in ROI. To be sure, all these calculations can be controversial, and some Republicans will oppose any such spending, on the ideological assumption that government can never, at any time, under any leadership, do anything right. Here we can pause to note that such a blanket assertion, of course, would be news to the American visionaries who built the Panama Canal, or the Interstates, or the Internet. And it would also be news to Trump; after all, during his long career as a builder, he has made a habit of finishing projects ahead of schedule and under budget. The federal government will get money back because, as I said, these are good-paying jobs. You’re going to be putting people to work. They’re going to be paying taxes. That money is going to come back to Washington. To be sure, some conservative (in reality, they are mostly libertarian) economists will argue that any new debt is bad, period. Beyond their obvious knee-jerk hostility to anything the government might do, they argue that government borrowing “crowds out” private investment. Yet this is a difficult argument to sustain, considering that interest rates for federal borrowing are hovering around two percent. And as noted earlier, such low rates, adjusted for inflation, are, in fact, negative—which means that it actually pays to borrow. Underlying this entire debate, of course, is the question of economic and political worldview. And in public policy, worldviews are typically expressed in economic models. Such models guide the econometric assumptions that forecasters make about the way the economy will work in the future. Such models, all computerized, may seem precise and mathematical, but in fact, an economic model is only as good as the basic instinct of the modeler. Thus so we can return to the question of “crowding out,” and how to model it. That is, the key variable of whether or not borrowing for infrastructure might crowd out other kinds of borrowing. And here, as Bloomberg’s Brendan Greeley has observed, economists are coming around to the view that crowding out is not a problem, because, frankly, there’s so much money floating around that investors don’t really know what to do with it. That’s why interest rates are so low, because the supply of cash, worldwide, exceeds productive ways to spend or invest it. Thus we can see: Arcane quasi-academic debates about modeling supply-curves and economic multipliers can have huge political repercussions. We might pause to note that the Post, sometimes called the “Bezos Post,” after its owner, Jeff Bezos of Amazon.com, has become a relentless font of opposition to anything having anything to do Trump. Why the hostility, beyond, of course, the Post’s familiar standard-issue liberalism? Perhaps it’s because Trump has promised that if he is elected, Amazon, boasting a stock-market capitalization of almost $400 billion, will have to pay its fair share of taxes. As Trump said in May, “Amazon is getting away with murder.” No wonder the Post writes 10 or 20 anti-Trump articles every day. And thus we can see: If you really want to make a progressive mad, tell him that he, too, has to pay tax at the same rate he demands of the middle class. So the path of Trump’s infrastructure plan is full of bumps and blind alleys. So we’ll have to see what happens—although, of course, we know this much: It’s a mistake to bet against Trump. Indeed, Virgil feels confident in predicting that under President Trump, America will spend a lot more on genuine job-creating infrastructure than it did under President Obama or than it would have under a President Clinton 45. And that’s something to cheer about. Indeed, all the early signs suggest that Trump is keeping his promise to remember the Forgotten Man and the Forgotten Woman. Furthermore, if we remember our 20th-century American history and think back to the example of another bold New York-born chief executive, we then realize that a president who keeps his word to Forgotten America is amply rewarded, not only in the next election, but also by historians in the far future.